The best time to visit Thailand is from November to February when the northeast monsoon is blowing cool, dry air which serves as a respite from the heat. During this cool season, the temperature ranges from 18°C to 32°C in Bangkok. The summer period, or hot and dry season, is from March to June. At this time temperatures in Bangkok average around 34°C, but can often reach 40°C with the humidity levels of 75%. But again, no matter when you visit Thailand, there are always ample opportunities for you to enjoy the aerial activities. Sky Diving & Parachuting: The perfect adrenaline fix during your holiday or business trip. 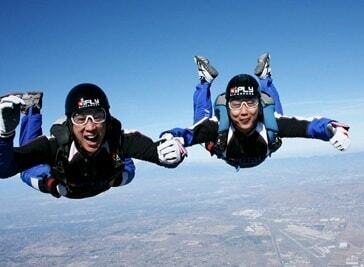 Jumping out of a perfectly good airplane with experienced Instructors is the easiest way to enjoy a skydive. 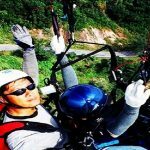 Paragliding: In Bangkok, you will find some really good packages for paragliding. You will appreciate the concern for safety and the focus on developing paragliding fundamentals that will help provide you with a more secure future in the sport. Enjoy kiting the glider at the top of a hill with a view of the South of Thailand. Bring the family and the dog out to watch the action anytime. Thai Gliding School is the longest running paragliding school in Thailand and offers consistent, quality instruction. SFAT Advanced Certified Instructor, has over 10 years of experience user-friendly theory progression, both in the classroom and at their flying sites, will keep your growth and interest at its peak. On your life changing Tandem Skydive, you will be briefed by your Tandem Instructor about the jump, and then you'll be on the aircraft enjoying the scenic ride upto altitude. You can see the Gulf of Thailand, beautiful beaches, and Pattaya too. And then it's time to Jump!!! After you exit the aircraft, securely fastened to your Tandem Instructor, enjoy the freefall and the adrenaline rush as you fall at speeds upto 200-220 kilometers per hour! !